David Friedman’s approach to the issue of peace is clear enough: Whatever Israel’s right-wing government wants, the United States should give. 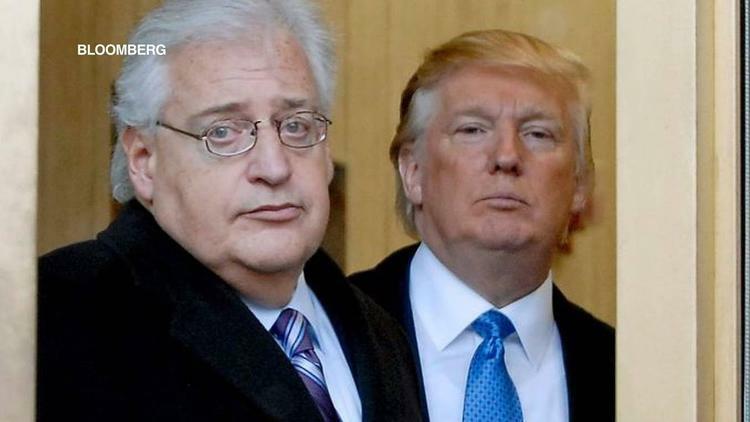 With his nomination of attorney David Friedman as the new United States Ambassador to Israel, President-elect Donald Trump has sent a very clear message that he intends to shift U.S. policy away from its decades-long commitment to ending the Israeli occupation that began in 1967 and establishing an independent Palestinian state alongside Israel. That commitment represents not only a strong American political consensus, but an overwhelming international consensus as well. Friedman’s views can only be described as radical. He is an avowed opponent of the two-state solution, which he has called “an illusion that serves the worst intentions of both the United States and the Palestinian Arabs.” He supports the United States moving its embassy to Jerusalem, which security experts have warned would be a needless provocation that could further inflame the region, and has described the State Department (which, should he be confirmed, he will be working for) as anti-Semitic and anti-Israel. He has even called supporters of the pro-Israel, pro-peace group J Street “worse than kapos” (these were Jews who served as middlemen for the Nazis in World War II), and heads fundraising for one of the most radical pro-settler organizations in the world. Friedman’s statement clearly contradicts every human rights organization in the world, including in the United States and Israel, as well as the State Department. It also suggests a troubling detachment from the reality of the conflict on the ground. Mitchell Plitnick is vice president of the Foundation for Middle East Peace.